That's not smoke. That's a busted radiator letting loose a cloud of radiator steam. The "Coffee Rocket" Porsche may be done, but hopefully they caught the leak before it did major damage. 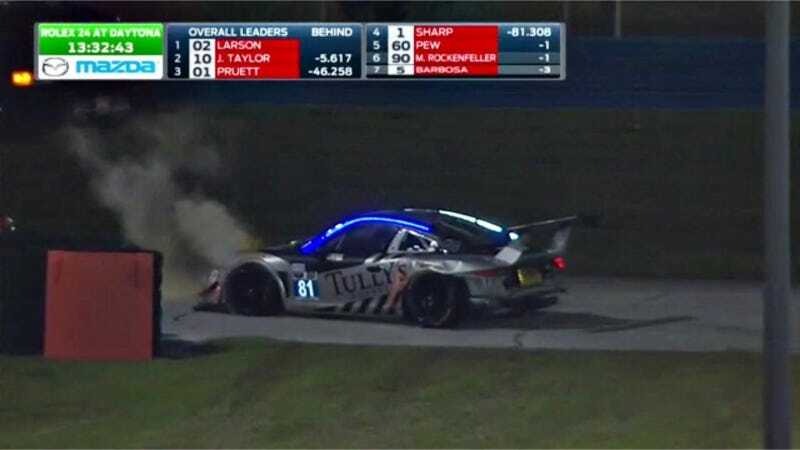 The number 80 GB Autosport Porsche 911 GT America has been running without a rear bumper for the past couple hours, but it appears as though the impact may have crushed a radiator. I'm tellin' you, man. Between this, the glued-in water hose that comes undone on the Mezger engines, and my 944's tendency to spill coolant all the time, I'm ready for Porsche to go back to air cooling. I'm. I'm done. No more coolant. Coolant bad. This is a huge bummer, considering that Supercup nutter Kuba Giermaziak is on the team for the weekend. He's used to running a 911 with a damaged rump. Hopefully the car's not done. This car has five drivers for the full 24 hours. That's five dudes who have had their evening ruined by Satan's preferred Porsche cooling method. Luckily, driver Michael Avenatti had the sense to pull into a service road, safely out of oncoming traffic. Now the team is working on piecing the car back together as we speak. Go, Team Coffee Rocket, go!